თალუსი როზეტისებრი, იშვიათად გაურკვეველი ფორმის, 12 სმ-მდე დიამეტრის, შედარებით სუსტად მიმაგრებული სუბსტრატზე, ღრმად დანაკვთული; ნაკვთები 1-4 მმ სიგანის, მომრგვალებული ბოლოებით. ზემოთა ზედაპირი მომწვანო-მოყავისფრო ან ყავისფერი, ცენტრისკენ უფრო მუქი, მქრქალი და დანაოჭებული, კიდეებთან ახლოს უფრო გლუვი და პრიალა, სორედიებისა და იზიდიების გარეშე, იშვიათად აპოტეციუმებით და პიკნიდიებით. ქვემოთა ზედაპირი მუქი და მქრქალი პერიფერიისკენ, ყავისფერი და პრიალა ცენტრისკენ, კიდეებამდე მოკლე, შავი რიცინებით, რომლებიც ხან გადადის რუდიმენტულ წამწამებში. აპოტეციუმები 5-8 მმ დიამეტრის ჩამჯდარი ან ოდნავ წამოწეული; თავდაპირველად პრიალა, ჩაზნექილი, ხოლო შემდეგ მქრქალი, მეტნაკლებად ბრტყელი, ყავისფერი დისკოთი, ნორჩობაში სქელი, ხოლო შემდეგ თხელი კიდით. სპორა ელიფსისებრი ან კვერცხისებრი, 8-12 X 4-7 მკმ. სვანეთი, რაჭა-ლეჩხუმი, მთიულეთი, ჯავახეთი, მესხეთი . გარე კახეთი – ,,ქვის ხავსი, მოყავისფრო, ქვებზეა ოღონდ მდინარის პირებზე არ არის, უნდა შეაგროვო ნამიანზე თორე მშრალი იფშვნება, თუჯის ქვაბში ვღებავდი, წყალში ჩავყრიდი ამ მცენარეს, ადუღდებოდა და ჩავყრიდი ძაფის ხიფებს. გამოდიოდა ჟანგისფერი-მოყავისფრო, ფერი არ გადადიოდა. რეცხავდნენ ნაცართვალში. ამას აკეთებდნენ შემდეგნაირად: გაცრიდნენ ნაცარს, დაასხამდნენ წყალს და ადუღებდნენ, შემდეგ დადგავდნენ და ნაცარი მიდიოდა ქვემოთ და ზემოთ რჩებოდა წყალი. აი, ამ წყალში რეცხავდნენ შეღებილს“ . აჭარა – „დიდ ლოდებზე რომ არის ფერად-ფერადი, იმას ვაგროვებდით ბავშვობაში და დავყრიდით ლიპ ქვაზე, მეორე მოგრძო ქვით მოვურევდით, სანამ არ გაიხსნებოდა, ვიყენებდით სახატავად ფურცლებზე, ქვებზე. აბა, სად იყო ფერადი ფანქრები. ვიღებდით ჟანგისფერს, ყავისფერს, თეთრს, გახუნებულ ბალახისფერს. მოწითალო უფრო ქვაზე ზემოდან მზის მხარეს იყო, მწვანე უფრო ჩრდილის მხარეს იზრდებოდა“ . 1. მგელაშვილი, თ. 2015. სოფ. გომბორი, საგარეჯო. 2. კვიახიძე, ე. 2016. სოფ. რიყეთი, ხულო (ეკომიგრანტი სოფ. ღრმაღელეში, ლანჩხუთი). 3. ნახუცრიშვილი, ი., ყანჩაველი, ქ. და სხვ. 1986. საქართველოს სპოროვან მცენარეთა ფლორა (კონსპექტი). საქ. სსრ მეცნ. აკად., ნ. კეცხოველის სახ. ბოტანიკის ინ-ტი. – თბილისი: მეცნიერება. Thallus rosette-like, rarely irregular, up to 12 cm diam., relatively loosely attached to the substrate, deply lobed; lobes 1-4 mm wide, with rounded tips. Upper surface greenish-brown or brown, darker, opaque and reticulate towards the centre, smoother and shiny towards the margins, without soralia or isidia, rarely with apothecia and picnidia. Lower surface dark and opaque at margins, brown and shiny towards the centre, covered with short black rhizines reaching the margins and sometimes forming short cilia. Apothecia 5-8 mm diam., slightly submerged to slightly elevated, with initially shiny and concave, later opaque, +/- flat brown disk, and initially thick, later thin margin. Spores ellipsoid or ovate, 8-12X4-7 µm. On stones in sunlit places. 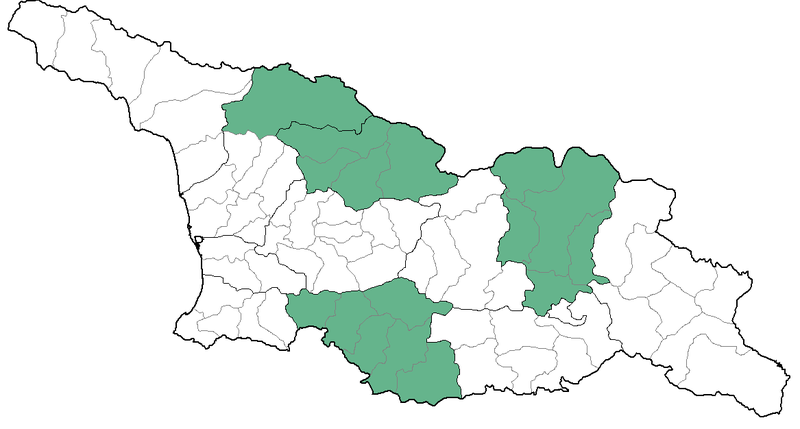 Svaneti, Racha-Lechkhumi, Mtiuleti, Javakheti, Meskheti . 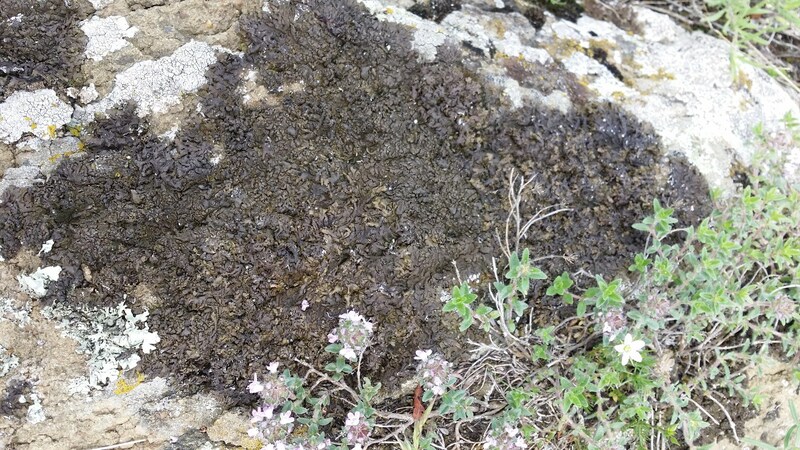 Gare Kakheti – “Stone moss (“kvis khavsi”) is brownish, occurs on stones but not on riverbanks; it should be collected covered with dew as it crashes when dry. Thread was coloured in cast-iron pots, the plant was poured into a pot, boiled and thread rolls were then put into the boiling mixture. The moss gave rusty-brown colour and it did not fade. Then the thread rolls were washed in ash water (“natsartvali”): ash was sieved, covered with water and boiled, then left to let the ash to settle down and the water above the precipitate was used to wash the coloured thread rolls” . Adjara – “In childhood we collected colourful things that occur on big stones, poured them onto a wet stone, then steered with a long stone until they dissolve and used to paint on paper. We did not have colour pencils. Thus we made rust-colour, brown, white, dry-grass-colour paints. Reddish ones more often occurred on the upper sunlit side, green ones more often grew on shaded side” . 1. Mgelashvili, T. 2015. Vill. Gombori, Sagarejo. 2. Kviakhidze, E. 2016. Vill. Riketi, Khulo (eco-migrant in vill, Ghrmaghele, Lanchkhuti). 3. Nakhutsrishvili, I.G., et al. 1986. Flora of Spore-producing Plants of Georgia (Summary). Metsniereba, Tbilisi.